As effective as that is some schools may prefer parents not use the C.O.B.R.A. Anti-Bully Action Plan. Why? Because one of the first steps is for parents to send the principle and teacher a specially crafted certified letter putting them on notice about the bullying. It’s one thing for a parent to inform a teacher their child is being bullied. It’s entirely different when a certified letter arrives with specific language that creates a new level of urgency and gravity. This is just one step in this comprehensive program designed by Chris Sutton of Clearwater, FL. Sutton is a former street cop, sheriff, and maximum security corrections officer. In the C.O.B.R.A. Anti-Bully Action Plan, Sutton teaches how to build a legal case against a bully. The program includes letter templates to send to teachers, principles, and even the school board. While some programs advocate contacting the parents of a bully, Sutton says that’s not necessary. Sutton says, “Contacting the parents is a stress you do not have to go through. The C.O.B.R.A. Anti-Bully Action Plan includes detailed bully prevention strategies for in person and online social bullying. One of those strategies details where and when your child may be in “shark infested waters.” Shark infested waters are the times and places where bullying is most apt to occur. The bus stop, the playground, unsupervised time at school are all shark infested waters. Just teaching your child to recognize shark infested waters is a step towards avoiding bullies during that time. 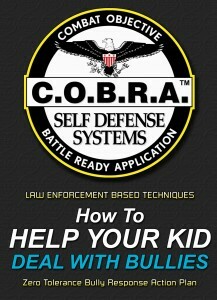 Once bullying has occurred, the program provides a step-by-step action plan with scripts, letter templates, evidence gathering techniques, role plays, and specific questions to ask your kids that elicit the answers you are after.